We spend all year preparing for this very special time. Our goal is to put the joy back into gift giving with truly unique ideas for everyone on your list. Avoid chain stores and crowded shopping centres with the same old stuff. Shop with us for gifts with soul and a beautiful story to match. We make it easy to be a conscious consumer and support small makers locally, in Aboriginal and Torres Strait Islander communities, and in developing countries around the world. Spread the love far and wide. Every Christmas, Koskela has a theme that celebrates an Aboriginal and Torres Strait Islander community and their art centre. This year we have partnered with Tangentyere Artists and are having a Town Camp Christmas. Town Camps are settlements in Alice Springs where residents have relocated from throughout Central Australia to access the amenities of a city. Despite the sometimes difficult conditions there is a strong sense of community in Town Camps, and Christmas is a time where everyone comes together in joyful celebration. Koskela has been working with Tangentyere Artists all year to develop and license a range of artworks, which adorns our wrapping paper, gift tags, greeting cards and in-store holiday displays. 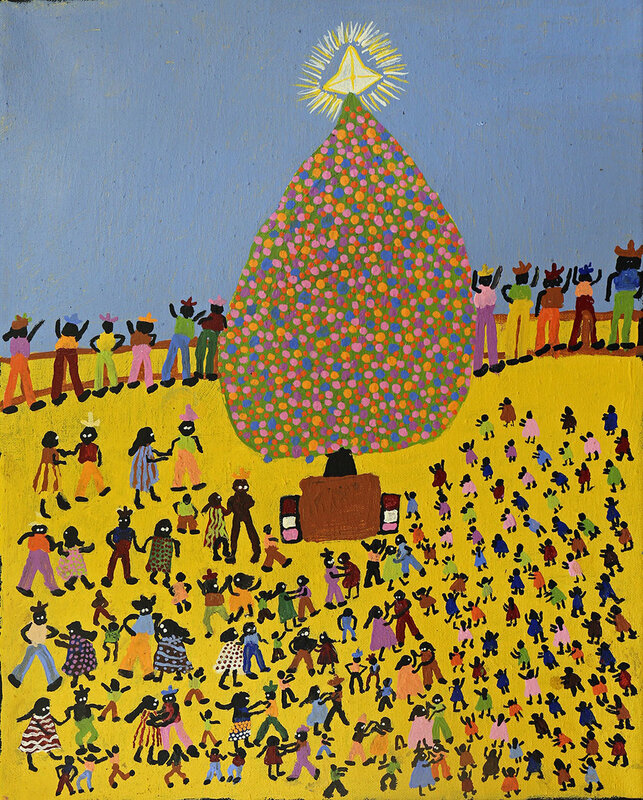 Dancing at Christmas Time in Alice Springs by Grace Kemarre Robinya is one of the artworks we licensed, which has been applied to our wrapping paper. You can get your Christmas gifts wrapped for a gold coin donation. Proceeds will go towards Akeylerre Inc. This is a non-profit organization developed by the Arrernte people in the Alice Springs region to acknowledge and promote cultural knowledge, practice and expertise recognised as being integral to the wellbeing of the community. Complete the look with a gift tag for $2, or greeting card for $4. Our Rosebery store is a wonderful gift emporium with a calm atmosphere where you can thoughtfully choose presents and have them gift wrapped. We are open from 9am-5pm on weekdays, 9am-4pm on Saturday and 10am-4pm on Sunday. If you prefer to shop online but want to avoid shipping, take advantage of Click & Collect. Call us when you’re on approach to collect and we can deliver it to your car so there is no need to find a park! In keeping with our Town Camp theme Santa will be dressed as a stockman of yesteryear for photos in a festive outback setting. Get in quick to grab a goodie bag filled with awesome Christmas gifts. They are $45 each and worth a whopping $350. *Discount excludes books, art, Loom floor rugs, Tili Wiru and Yuta Badayala. Paintings from Tangentyere Artists and Yarrenyty Arltere, alongside baskets from Tjanpi Desert Weavers. Koskela Gallery’s final exhibition of 2018 showcases new works from three Aboriginal-owned art co-ops in Alice Springs in celebration of Town Camp life. More than 50 market stalls, food trucks, gingerbread house workshops, jumping castle, kids activities, Santa, live music and more! In our Rosebery store we will be running kids’ crafts in the workshop. Decorate a ceramic ornament or make a garland with recycled waste. Entry is a gold coin donation with proceeds going to Akeylerre Inc.